Living in a huge home comes with obvious benefits, like more privacy, neighbors whom don’t share a wall with, and the biggest perk or all: more space than you can handle. But there’s no reason you can’t make your tiny apartment feel larger than it is. As long as you’re willing to get creative, make some minor design sacrifices, and think outside the box, your small space doesn’t have to feel like one. Trying to fit all your belongings in a tiny apartment can be downright frustrating, but figuring out an arrangement that keeps you from feeling super cramped and longing for a bigger place can actually be a fun project that allows you to finally bring your picture-perfect Pinterest apartment vision to life. Put on your decorating hat, and prepare to make your tiny apartment *feel* like a huge home. If it’s within the terms of your lease agreement, painting your place will help to give the illusion of larger space. As Apartment Therapy points out, white walls help open up space, but can also tend to give off a cold, lifeless vibe. Avoid this by choosing a shade of white that contains a little bit of color, like off-white, cream, ivory, or eggshell. Sites like Etsy and Overstock have tons of multifunctional furniture like wall mirrors, coffee tables with lifting lids, end tables, footstools, and chests that all serve both decorative and storage purposes. If there was ever a time to summon your inner neat freak, it’s when you move in a tiny apartment. Too much clutter is never a good thing, but the problem will be magnified when space is limited. Start opening up space by designating all of your counter and tabletops as clutter free zones. Then continue by getting rid of other unnecessary stuff, and only keep items that enhance the apartment’s floor plan instead of overwhelming it. 4Switch up your approach to hanging curtains. The Spruce offers a simple decorating tip to combat the small space blues: Hanging curtains from the ceiling instead of the top of the window frame will make a smaller space appear bigger by creating the illusion of height and depth. 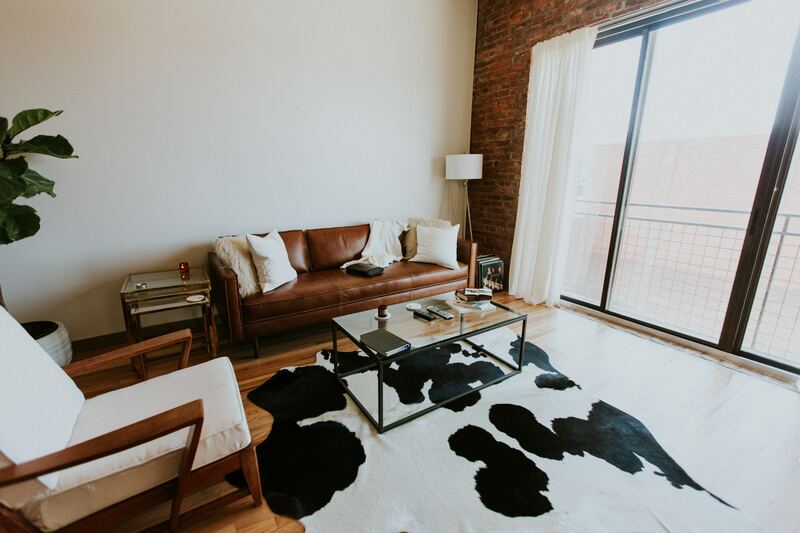 If you can’t resist the urge to decorate your apartment with a big, bulky piece item, limit it to one thing that serves as an statement piece. Leaving space around your furniture will keep your tiny apartment from looking cramped, so avoid pushing your pieces against the wall. Better Homes & Gardens counts a taller headboard as one of the ways to utilize vertical space in your bedroom. 8Use glass or other reflective materials. Strategically placing reflective materials makes small spaces look larger. Furniture made of metallic, glass, lacquer or lucite help to fill a space with light, which will brighten up your apartment and give it the feel of a spacious home. 9 Keep window treatments to a minimum. Pass on the elaborate window treatments. They look pretty but they also keep light from getting in. To add even more depth to your home, opt for the bare window look. 10 Use your walls wisely. Instead of sitting a TV on a floor shelf, mount it on the wall to save space, and create a feeling of openness in your apartment. Also, use large paintings or carefully arrange smaller pictures in a way that doesn’t make the wall feel crowded. Tiny apartments may not have the roomy feel of a sprawling estate, but with smart decoration decisions they can give off the appearance of being larger with enough charm to make up for the difference in size.